Quantum physics that has been around for some hundred odd years now is still mainstream physics most accepted physics. Although quantum science has revealed the presence of the zero point field with all its virtual subatomic particles and photons that jump into existence from apparently nowhere to return to oblivion nanoseconds later, there is still is no reasonable explanation as to how and why particles and photons can appear and disappear just like that. Also the quantum probability wave is still hard to grasp and visualize. Quantum physics may have proven to be a mathematically correct science; for lay people the wave-particle duality of quantum science it is still very hard to understand. How do we visualize particles that are both waves and solid little marbles? Another difficult thing to grasp is the atom model presented by Niels Bohr where electrons fly in well-defined shells around the nucleus. Since electrons continuously radiate energy they should eventually collapse into the nucleus, but they don’t! The question is where does this radiating energy actually come from and how is it replenished? Quantum science has accepted the quantum states of the electrons (distinct shell within the atom) for a fact, but is unable to answer the question why the electrons only occur in discrete shells within the atom and why they don’t eventually crash into the nucleus. Even three hundred years after the discovery of gravity by Newton, science still has no theoretical explanation for it. This is exactly why science is moving forward to find new theories that can better explain the anomalies of quantum science. Today mainstream science’s best shot is the string theory. However, a small group of scientists are now taking a radical new view, and their thinking is taking them back to insights from ancient history. For hundreds of years brilliant physicists and philosophers have tried to represent our world in mathematical models of particle physics that state that our physical world is made of matter of which the smallest part is called the ‘atom’. Atom is an ancient Greek word meaning undividable; it is supposedly the smallest part of matter that cannot be divided anymore! Quantum mechanics however noticed that particles in some cases behaved like waves and later introduced the wave-particle duality. Some quantum scientists already suggested in the past that the quantum waves could be real waves after all, existing in the physical domain. They did not believe in particle wave duality. As long ago as 1937 Erwin Schrödinger wrote that ‘what we observe as material bodies and forces are nothing but shapes and variations in the structure of space itself’. Eventually even Einstein rejected the idea of discrete particles and believed that particles were in fact part of a continuous field. A growing number of post quantum physicists are discovering what Einstein and Schrödinger already assumed; physics may have been on the wrong track all along, misled by the idea that the material world exists of separate hard particles! They are suggesting now that we may live in a wave-based universe. Matter is simply the focal point of a vibration in an energy sea called the aether. In Greek antiquity, the Greek scientists and philosophers believed that nature only counted four elements; earth, water, fire and air. The atoms were believed to be the building blocks of these four elements of the universe. Aristotle added the fifth element aether and postulated that planets and stars were made of this aether. Greek philosopher Plato, 350 years B.C., described these five elements and added that matter is created from the five Platonic solids that he described in his book Timaeus. He equated the tetrahedron with the element fire, the cube with the earth, the icosahedron with water, the octahedron with air and the dodecahedron with the aether, the stuff of the planets and stars. We now know of course that there are far more elements in nature than the ones known in Greek antiquity. However, it is a well-known fact that the Platonic solids play a role in chemistry as the internal organization structures of molecules in many materials. For instance the Platonic solids show up in the organization of molecules of natural crystals. In this chapter we will present a new theory about matter that agrees with Plato that the atoms are constructed from the Platonic solids. Some scientists now believe that the aether is a subtle energy that flows through all material things like some liquid, creating the material world from it. The Platonic solids are believed to be the geometrical internal structures of the atom. That’s the reason why sacred geometry is so important in this new aether theory. In the 19th century the luminiferous aether was well accepted by science! It was the medium through which the electromagnetic wave was supposed to propagate. In those days physicists believed that matter and the aether were two separate things. The aether served as the carrier medium for radiant energies such as light and was believed to transmit force fields between material objects in the universe such as gravity. James Clerk Maxwell, the founder of electrodynamics and his contemporaries didn’t have any doubt that the aether existed. However in 1887 Albert Michaelson and Edward Morley conducted an experiment to prove the existence of the aether. At the time light was thought to be a compression wave that propagated as a longitudinal wave through the motionless and stationary aether, just like sound waves through the air. While the Earth itself is spinning, the Earth must have a relative motion with respect to the motionless aether. They reasoned that when the speed of light is measured on the surface of the Earth, it should give different results when measured clockwise or counter clockwise with respect to the rotation of the Earth around its axis. However the Michelson Morley experiment proved that the speed of light had the same constant value no matter in what direction the speed of light was measured. From this experiment it was concluded that the aether did not exist. Physics has abandoned the aether theory ever since. However today scientists believe that the results of the Michaelson-Morley experiment have been misinterpreted. So now after a hundred years the aether is back in physics. In the new emerging physics, the Newtonian particles and quantum mechanical particle/wave duality is abandoned. In new aether physics there are only waves! The aether is the medium of the electromagnetic waves and it is assumed that the aether is a non-material fluid-like medium, a subtle energy substance that permeates the entire universe. It is a well known fact that waves require a medium to wave in: without a medium, sorry there can be no waves. Sound requires the air. For water waves it is the water that waves. But for some unexplainable reason ever since the Michaelson-Morley experiment supposedly disproved the existence of the aether, physics accepted the fact that electromagnetic waves can travel through empty space without any medium at all. How absurd, if there is no medium, then what is waving? How is light to propagate as a wave phenomenon if there is nothing to propagate in? Physics accepted that light could travel through absolute nothingness only because the Michaelson-Morley experiment had failed to prove the existence of the aether. An astonishing premise of the revived aether physics is that there is no dualism, no distinction between a material and immaterial thing; it’s all energy since energy is all there is! Matter is not a fundamental property of the universe; it is the form not the substance that shapes matter. Now we finally can take Einstein’s famous formula E=m * c², one step further and really start to understand what this formula implied! It is not that energy and matter can be interchanged; no, matter = energy, period! In this sense matter is an illusion of solidness and separateness. Eastern spiritual traditions have always claimed that our world is Maya, illusionary. What they meant by this is that separateness does not exist; there is only the unity at the fundamental level of existence, the unity of Brahman. Now we may see Eastern wisdom corroborated by modern day science! Our universe is multi dimensional and it is made of one substance and one substance only! This substance is called aether and it is a vibrating fluid-like energy that permeates the physical vacuum. Matter as we know it is created moment by moment as a standing wave, a vortex in the physical vacuum. It is the condensed center of these vortexes that creates the illusion of a separate particle. All matter in the universe is interconnected since the particle fields extend to the far corners of the universe. A precursor of aether physics is the Wave Structure of Matter theory by Milo Wolff. In 1986 Wolff formulated a theory that he called ‘the Standing Wave Structure of Matter’ (abbreviated to WSM theory). Independently Geoff Haselhurst came to the same conclusion about a standing wave theory for matter and they are working together as of 1998. The WSM theory is relatively simple. It proposes that matter is the focal point of a standing wave the result of two interfering waves. One is an inward wave moving towards the center and the other is an outward-bound wave moving away from the center. The waves are spherical waves in the fabric of space. The center of the two spherical waves is the ‘point particle’ center. As simple as the axiom of this theory is, the properties these standing waves can assume seem to be immense. Whereas almost all physical laws both in Newtonian and quantum physics were empirically derived from experiments, Milo Wolf says he now has theory that a priori, from theoretical principles, allows the laws of both relativity and quantum physics to be determined! If he is right the origin of the physical laws and the properties of charge, mass and gravity, for the first time can be understood. Mainstream physics could never really explain these; for one thing we still don’t know what gravity really is; we have known the physical laws of gravity since Newton; however we don’t know what’s causing gravity! A wave structure of matter had already been proposed 130 years ago by William Clifford, he declared that ‘all matter is simply undulations in the fabric of space’. Unfortunately, his colleagues never took his work seriously. In the WSM theory matter is just the interference pattern of in and out waves. The in-waves of a given particle are the out-waves of another particle. In this way all matter in the universe is sustained and mutually dependent. In and out waves tie all the matter in the universe together. Paul La Violette has developed a general system aether theory called subquantum kinetics. He believes that science is wrong about many aspects in physics including the Big Bang theory that tells us that the universe came into existence from one big cosmic explosion. According to the Big Bang theory, the universe inflated from what is called a singularity, an infinitely compressed point in space, into a volume of several hundred million light-years in diameter in just 10־³² seconds! This event required that all known laws in physics, including the laws of thermodynamics, Einstein’s relativity laws (nothing can exceed the speed of light) were disabled for the happy occasion, the birth of all matter and energy from complete nothingness. After this briefest of moment of time, the holy laws of science were re-enacted and ever since the universe does not allow energy and matter to be created from the same nothingness any longer (first law of Thermodynamics). At its birth, the universe showed its highest degree of organisation and physics dictates that this order eventually will decay into complete chaos again (second law of thermodynamics). Scientists call this the increase of entropy. Paul La Violette does not contradict these laws; on the contrary, he simply doesn’t believe that these laws were disabled for just this split second during the Big Bang. In his book ‘Genesis of the Cosmos’ he mentions many more problems with the Big Bang theory such as the explanation for the observed red-shifts of stars that cosmologists use as proof that our universe has been expanding ever since the Big Bang. The red-shift of the stars is believed to be caused by the Doppler effect as stars move away from our point of reference. Cosmologists never took the alternative tired light explanation for these red-shifts seriously- that is, the fact that light travelling over billions of light years may be absorbed by intergalactic material resulting in a loss of energy and an increase of wavelength. La Violette believes that the cosmology of the ancients is a better alternative that does not suffer from the Big Bang’s singularity problems. According to many ancient cosmologies, the universe evolved over billions of years as a result of a continuous process of matter and energy creation from a supposedly fourth dimensional realm, the aether. This creation process has never ceased and still continues today according to La Violette. To sustain his claims, he explains that the universe at heart is not a closed but an open system and is able to receive energy and matter from a fourth dimension without contradicting the laws of thermodynamics. The aether is supposedly an unobservable metaphysical realm, a non-equilibrium transmutable medium that continuously fluctuates. When fluctuations reach a critical threshold they are able to spawn stable waveforms in our observable physical universe. It was only in 1973 that system theorists learned about chemical solutions that were able to create self-organising chemical reactions that spontaneously started to oscillate. These chemical reactions such as the Belousov-Zhabotinski reaction periodically spawned so-called chemical or reaction-diffusion waves. The cross chemical reactions involved oscillate between low and high concentrations of the chemical compounds that drive the reaction. Let’s assume that the first reaction uses compound X to create compound Y, then the second reaction will be exactly the inverse of the first and use compound Y to create compound X again. There is a constant diffusion of the compounds from areas of high to low concentrations, hence the reaction-diffusion wave. These chemical waves will spawn beautiful Mandala like wave patterns when put on a Petri dish. To understand how the chemical reaction actually starts to oscillate let’s use the metaphor of the predator-prey system. Suppose we have a population of rabbits that has an abundant supply of lettuce. Since rabbits breed like hell, their population will grow fast. However in our little closed habitat there are also foxes that feed on the rabbits, limiting the growth of the rabbit population. Since the rabbit population grows fast, so does the fox population. However, since there is a feedback loop in our system, balance will be restored in our habitat; when the foxes eat too many rabbits, they will run into a food shortage, reducing the growth of the fox population and allowing the rabbits to survive. The fox-rabbit population will oscillate between two extremes, a minimum and maximum, a perfect example of a wave oscillation. From these observations, Paul La Violette reasoned that the aether may likewise spawn wave patterns from two aether states, two different aetherons, which continuously mutate from one state into the other and visa versa. In normal cases, the aether maintains its equilibrium state due to the second law of thermodynamics, however under critical conditions these aether transmutations like the predator-prey waves may become self-organising and form stable wave patterns. These wave patterns will become observable in our physical universe as electromagnetic energy, light. His theory has been tested in a simulator model called the Brusselator and uses two X and Y aetheron states to prove that under critical conditions, self-organising oscillations may spontaneously come into existence. The actual ether reaction used just a few more intermediate ether states but for the sake of simplicity aetherons X and Y are the only ones mentioned here. The transmutation aether model of Paul La Violette brings to mind the transmutation of the Chinese Yin and Yang energies mentioned in the I Ching, the Book of Changes. The I Ching mentions creation as the result of cyclic mutual transmutations of Yin and Yang energies. The female Yin energy transforms into the male Yang energy and vice versa in an eternal process of physical manifestation. Paul La Violette’s sub-quantum kinetics perfectly describes how the aether realm spawns waves that we observe as light in our universe. Since this light forms a standing wave that is eternally replenished by the aetheron transmutations, this is what we finally observe as quantum particles of matter. Sub quantum kinetics yields a better alternative for the required in and out waves of Milo Wolff’s WSM theory. As we progress in our understanding of how matter is actually shaped from the aether, we will see in the next paragraphs that the vibrations created from the aether must be organised in vortex shapes in order to shape the atom. David Thomson and Jim Bourassa both founded the Quantum AetherDynamics Institute and are independently developing an aether based model integrating, quantum mechanics, relativity theory and string theory. The model describes matter as a subatomic whirlpool, tornado or vortex in the aether. They call this vortex the Toroidal (A) Aether Unit (TAU). When combined in spherical configurations they form the nucleus and electron shells of the atom. Quantum AetherDynamics mentions that the aether has both mechanical and electromagnetic properties. The mechanical property is what gives matter its mass; it’s the angular momentum of the whirling aether energy. Mass is simply the inertia created by the aether vortexes much like the inertia that is created by a spinning top. Sacred geometry plays an important role in the aether physics that we are presenting in this book. The reason is rather straightforward. When the universe is shaped from one substance and one substance only, then the only way to give the physical world a seeming separate appearance of individual material things is through form, since substance by itself cannot discriminate. Hence the geometry of the aether and how it is structured is the crux in creating the material world. The relation between vibration and geometry is beautifully described by the work of Swiss medical doctor and natural scientist Hans Jenny (1904-1972) in a science called ’Cymatics’. The late Buckminster Fuller (1895 - 1983) however was the first to discover that a relation between musical frequencies (The Diatonic scale) and geometrical forms exists. He used a balloon submerged in blue dye and vibrated it with frequencies from the musical scale (the 7 white keys from the piano): as a result of wave interference, marvellous two dimensional arrangements appeared on its surface. Dr. Hans Jenny carried on the work of Buckminster Fuller and tested these standing wave vibrations in spherical volumes of fluid. Much to his surprise all of the Platonic solids, named after the legendary philosopher Plato, showed up as geometrical patterns. What you see in the picture above is a star-tetrahedron; it is also on the cover of this book! If you examine the picture carefully you may have noticed the two equilateral triangles, one facing up and one facing down. Together they form a symbol that is known as the Jewish Star of David, but remember in 3D reality the two triangles are tetrahedrons, three sided pyramids. The white curved and straight lines in the photograph are the places where the vibration is cancelled, these are the nodal points, the still places to which the colloid particles dissolved in the fluid take refuge when the fluid is vibrated. The geometrical patterns are the result of wave interference. When the outgoing waves from the center of the sphere meet the reflected waves from the surface of the sphere, standing waves are formed. Plato explained in his book Timaeus that the Platonic solids are the basic forms that construct matter and that this knowledge came from the legendary Atlantis. We now have proof that humanity knew about the Platonic solids even before Plato. In the Ashmolean Museum in Oxford they preserve all of the 5 Platonic solids and some additional semi-regular solids that were described by Pythagoras. Carved out of stone the Platonic solids are dated at least a thousand years before Plato! These stones were found in Britain and belonged to the Neolithic peoples, a culture that according to our current understanding did not have the mathematical ability to understand these forms - nonetheless they carved them out of stone! Now isn’t this surprising that a vibrated fluid can create forms such as these and that these forms have been described by Plato some 400 years BC? it’s about vibrations that take on geometrical patterns! Sacred geometry was preserved throughout history in Freemasonry circles since it was believed to be important knowledge revealing the secrets of our universe! Contemporary scientists now tell us that in fact all of creation is the offspring of aether vibrations just like the Eastern Hindu cosmology has always talked about the Ohm sound of Brahman as the vibration that creates the physical world. 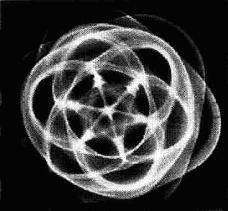 Daniel Winter and David interpreted these Cymatics experiments, and both agree that the Platonic interference patterns also occur within the aether, and that it is these interference patterns that really shape the atom. The Egyptians called matter frozen music and if indeed matter is the result of musical vibrations of the aether just like the Cymatics experiments demonstrate, we can now appreciate why. Daniel Winter presents a physics that is called ‘implosion physics’. He concludes that the entire universe, the material world is created from one non-material substance, the aether. The aether is a kind of super conductive fluid that flows right through all physical objects. The aether vacuum is an extremely dense nonetheless frictionless medium. The best comparison for the aether being non-material in nature is the super-conductive state of helium. When helium is cooled down to temperatures below 2 degrees Kelvin it becomes a super-fluid, which means that objects can move through this fluid with no friction at all. Daniel Winter now believes that vortexes, little eddies or tornados in the fluid-like aether are the basic building blocks of matter. Since the aether is some kind of a fluid, it follows the well-known physical laws of hydrodynamics. They called these torus-like flow forms the ‘Anu’ and mentioned that the atom is shaped from the aether using the Anu as a flow form. Daniel Winter supports the idea of these two clairvoyants and uses the torus shape from these observations along with the Platonic Solids to construct the atom. According to Daniel Winter the aether creates vortexes, little tornados of whirling and spiralling energy in the ocean of aether, our universe. The vortexes in the aether are like the little eddies in a river. The vortex is nature’s natural flow form for fluids. The same vortex flow form is created every time we pull the plug in our bathtub! Now the torus is a unique flow form in hydrodynamics, it allows fluids to spiral inwards and outwards on the same surface of the torus. It is a very stable flow form. If the universe is essentially created from one universal substance, the aether, it must be form that is used to create different and separate things out of this universal substance. The torus is nature’s perfect flow form to create a seemingly separate entity in the formless aether that is stable enough to last. The torus flow form is similar to the rings created by the smoke of a cigar. The cigar smoke whirls inwards on top of the smoke ring and comes out again on the bottom of the ring. It is constantly folding inwards to come around on the other side flowing outwards. The torus is often compared with the shape of a doughnut or an apple. It’s a spherical form folded inwards at the poles to form a small hole in the middle. The individual aether torus doughnuts can be nested inside each other. Nesting torus doughnuts requires that the vortex cones of the torus are aligned with the faces of the Platonic solids. The flat bottom of a vortex cone should touch the face of a Platonic solid. As an example we show the cube that contains 3 vortex pairs or 3 torus doughnuts aligned perpendicular to each other in a cube..
Now we may remember from the Cube of Metatron that the Platonic solids themselves can be nested, they fit into each other. Let’s take the cube, when lines are drawn to interconnect all centres on the 6 faces of the cube, they form the octahedron. The octahedron is fully circumscribed by the initial cube. The same process can be repeated now with the octahedron by interconnecting the centres of the faces of the octahedron. The result is a cube now circumscribed by the octahedron. This process can go on and on forever, creating smaller and smaller Platonic solids perfectly nested into each other, it creates a fractal, a repetitive geometric pattern. The nesting of the Platonic solids is not restricted to the cube and octahedron. All Platonic solids can be nested into each other. It is the nesting of the Platonic solids that creates the electron shells of the atom. Similarly however at a much smaller scale the nucleus of the atom is formed. The electrons in the electron shells correspond with the vortexes that are nested in Platonic symmetries. According to Daniel Winter, physics has mistaken these vortex waveforms for electron particles. Within the atom, the electrons orbit the nucleus at a fixed distance from the nucleus. The sphere that describes the orbital plane of the electron is called the electron shell. There are different types of shells in the make up of the atom that were given the names s,p,d and f shells and they contain respectively 2, 6, 10 and 14 electrons maximum. 1 vortex pair (1 torus) corresponds with the 2 electrons of the s shell. 3 nested vortex pairs in a cube correspond with the 6 electrons of the p shell. * In previous versions of this book it was mentioned that the d-shell with 10 electrons corresponds with the dodecahedron and the f-shell with 14 electrons corresponds with the icosahedron. This information has proven to be wrong, since the dodecahedron has 12 faces instead of 10 and the icosahedrons has 20 faces instead of 14. The decahedron and cubeoctahedron are quasiregular polyhedron and therefore no Platonic but Archimedean solids. A cubeoctahedron can be constructed from a cube by connecting the centre of the edges of the cube. The faces of the cubeoctahedron consist of triangles and squares making the polyhedron quasiregular. The cubeoctahedron (Archimedean body) of the f-shell. So matter is the stable flow form pattern emerging from the aether. It takes on geometrical shapes from a formless energy, creating the illusion of separate electron particles in the electron shells and the particles that make up the nucleus. Mainstream physics has never been able to explain why the atom has these ‘random’ numbers of 2, 6, 10 and 14 electrons in its electron clouds, the orbital shells around the nucleus. Daniel Winter’s model of the atom now explains exactly why these number show up in the period table of the elements! These numbers are related to the geometrical properties of the Platonic Solids! Also for the very first time we have an explanation as to why the electron does not crash into the nucleus and how it’s radiated energy is replenished. Electrons are not particles that encircle the nucleus instead they are standing wave patterns at discrete distances from the nucleus! The aether simply replenishes these standing waves eternally. Another way of looking at the torus shape is regarding it as a form that can be perfectly described by a set of Phi spirals. When pure sine waves with wavelengths of 1/ Ф, 1, Ф, Ф ², Ф ³ etc. are added together, they will form a perfect Phi spiral. When these Phi spirals circle around the torus they meet and interfere. As a result of this interference two new additional waves will be created. What is important to notice is that both new waves will have wavelengths that are again in the Fibonacci series. This allows that the interference will be non-destructive since the interference will simply result in more harmonics in the Fibonacci series. Whilst destructive interference is the norm in wave interference, the only exception in nature is when the waves interfere with Golden Mean ratio wavelengths! In other words, the Phi spiral can re-enter itself around the torus shape without destroying itself. So the Phi spiral is the universe’s only possible way to nest and become self-organizing. This is how stable matter can be formed from electromagnetic energy as a form of pure wave interference. ‘So now we have this dualism that waves in a line are energy and waves in a circle are mass, and because we don’t know how the wave got into a circle from the line and out, we conceive mass as separate from energy. E=MC^2 simply said that yes loop the speed of light back around on itself, and you made mass of energy’. The Golden Mean spirals of the torus shape eventually spiral into a perfect zero still point in the nucleus of the vortex that coincides with the nucleus of the atom. So these sine waves implode inwards into increasing smaller wavelengths. The implosion of the Golden sine waves into smaller and smaller wavelengths not only increases the frequency of the waves but also increases the speed of the waves to become super-luminal waves (travelling faster than light). According to Daniel Winter, this is what gravity really is, the cascade of Golden Mean electromagnetic sine waves that gain an ever-increasing velocity breaking the speed barrier of light. Einstein had always assumed that electromagnetism and gravity were related and Daniel Winter explains us how this connection is established. When doughnuts are nested to form the electron shells of the atom, the only requirement to continue this form of non-destructive interference is that these doughnuts align according to the Platonic Solid geometries. When these nested doughnuts inside the atom are arranged according to the Platonic solids symmetries, all waves will rush into the center of the atom, creating repetitive, recursive or fractal patterns that not only shape the electron shells but also the nucleus. Eventually the fractal patterns disappear into a zero point in the nucleus of the atom. The implosion of the electromagnetic waves into shorter and shorter wavelengths is what gravity really is. In a way the torus is a miniature black hole that attracts the light into itself creating gravity. The harmonious wave cycles that follow the Golden Mean ratio, the Phi cycles may be the origin of the word physical (Phi cycle). Physics would be simply the study of Phi cycles! An alternative model for the atom based on the regular Platonic solid bodies (regular polyhedra) stems from professor Dr. Robert J. Moon from the university of Chicago. In this model the protons that make up the nucleus are situated on the vertices of the Platonic bodies. The Platonic bodies used for the atom model, are duals like the cube and octahedron and the icosahedron and dodecahedron. Dr. Moon got his inspiration from Kepler’s Platonic solid model of the solar system. In the composition of the atom, only the cube, octahedron, icosahedrons and the dodecahedron are used, starting with the cube for the first element hydrogen. Hydrogen (H 1) has 1 proton and 1 electron, the proton sits on one of the vertices of the cube. The next element from the periodic table of the elements is helium with atomic number 2 and hence has two protons. The structure of helium (He 2) contains a cube whereas two vertices are occupied by protons. Oxygen (O 8) with atomic number 8 completes the cube with 8 protons, one at each vertex. The next Platonic solid that enters the nucleus in a nested fashion is the octahedron. The vertices of the octahedron touch the centre of the faces of the cube. The octahedron has 6 vertices and together with the 8 vertices of the cube forms 14 (6 + 8) vertices. The element that completes the cube / octahedron structure is silicon with atomic number 14 (Si 14). The next Platonic solid that nests in the nucleus inside the previous two Platonic solids is the icosahedrons with 12 vertices. The element that completes the icosahedrons with 12 protons has atomic number 14 + 12 = 26. This is iron (Fe 26). Next is the dodecahedron with 20 vertices. The element that completes this Platonic solid must have 20 + 26 = 46 protons. This is the element Palladium (Pd 46). The next increment of nesting Platonic solids is in fact a hinging of two dodecahedra, nesting does no longer occur, it’s a repetition of the first nesting. The interesting thing about Moon’s model is the fact that the Platonic bodies correspond exactly with the periodicity of the elements. German scientist Lothar Meyer and Russian scientist Dmitri Mendeleev used the periodicity of the atomic volume versus the atomic number that occurs between elements to compose the periodic table of the elements. The atomic numbers that correspond with the start of the groups (horizontal rows in the periodic table) are the atomic numbers 3, 11, 19, 37, 55 and 87. These are the atomic numbers with the largest atomic volume expressed as a coefficient of the atomic mass and density. The atomic numbers with the minimal volume correspond with the atomic numbers 8, 14, 26, 46. The properties of elements like compressibility and melting point follow the same periodicity as the former atomic numbers. Moon’s atomic model can explain the periodicity occurring in the table of elements with respect to the volume of het atom. The reason is that periodicity correlates with the completion of protons inside the cube (8 protons at 8 vertices), cube + octahedron (14 protons at 14 vertices), cube + octahederon + icosahedrons (26 protons at 26 vertices) and cube + octahedron _ icosahedrons + dodecahedron (46 protons at a total of 46 vertices). The elements at which the atom reaches it’s maximum volume are the elements with atomic numbers 3, 11, 19, 37, 55 en 87. This can be explained by the fact that these atomic numbers correspond with the completion of both protons and neutrons occupying the Platonic bodies in the nucleus. In a paper from 1988, Laurence Hecht proposes a distribution of the neutrons to enhance and complete Dr. Moon’s model of the atom. Hecht was looking for an explanation for the so called magic numbers 2, 8, 20, 28, 50, 82, 126, discovered by physicist Maria Goeppert-Mayer. Goepert-Mayer discovered that when these numbers either represent the atomic number (Z), or the number of neutrons (N), or the atomic mass (A), sudden leaps occur in the table of elements. These elements exhibit exceptional properties with respect to their neighboring elements. It must be stated that this is not a hard and fast rule, but a tendency. Magical numbers according to Hecht can be explained by the geometry of the neutrons following the Platonic solids. To this end Hecht introduces the tetrahedron next to the cube, octahedron, icosahedrons and dodecahedron in Moon’s atomic model. The geometry could be derived from the differences between the magic numbers themselves. The numbers 8 – 2 = 6 correspond with the 6 edges of the tetrahedron. The difference 20 – 8 = 12 corresponds with the 12 edges of the cube, 50 – 30 with the number of edges of the icosahedrons. In Hecht’s model the neutrons occupy the centre of the edges, while the protons occupy the vertices of the Platonic bodies. Hecht proposes the geometry of an alpha particle, a tetrahedron occurring as a dual of a larger tetrahedron as the first and smallest geometry within the nucleus. According to Hecht, the helium nucleus consists of a tetrahedron with two protons at the vertices and two neutrons at the centre of the edges. At the next element in the table of elements, lithium (Li 3), the neutrons remain in place, but the protons move to the vertices of the cube. The nucleus of lithium consists of a tetrahedron inscribed in a cube. In the following table the neutron distribution in the atomic model as proposed by Laurence Hecht is presented. In the table above, column N stands for the number of neutrons in the element. The prefix digits of the element is the atomic number, the postfix digits is the atomic mass (number of protons and neutrons). The table above is not complete and only comprises the elements up to atomic number 46, ending the completion of the cube, octahedron, icosahedron and dodecahedron with protons. With the neutron distribution enhancement to Dr. Moons model, the magic numbers 2, 8 ,20, 28 can be explained. The first magic number 2 is the first atomic number of helium, representing the introduction of the alpha particle with 2 neutrons. The magic number 8 corresponds with the completion of protons inside the cube. The magic number 20 corresponds with the start of a period; potassium (19-K-39) and calcium (20-Ca-40) have the same atomic mass and in fact both form the start of the new period. With scandium (21-Sc-45) the neutron filling of the octahedron starts. The filling of the icosahedrons with neutrons corresponds with element 28-Ni-59 corresponding with magic number 28 (1 neutron in the icosahedron). The sacred geometry that can be found within the Moon/Hecht atomic model based on the Platonic solids, makes that the properties such as volume, melting point and compressibility as well as the magic numbers can be explained. Until now no other model has been known to exist to explain these magic numbers. If we add Daniel Winter’s vision that elementary particles such as electrons, protons and neutrons are no more than vortices in the ether, the Moon/Hecht model of the atom can be seen as a nested set of Golden Mean vortices whereas the flat bottom of a vortex cone coincides with a vertex of a Platonic body. The Golden Mean waves that make up the atom, implode all the way into the nucleus following the laws of Sacred Geometry. The repetitive patterns of the Platonic solids that fit into each other are fractals. A fractal is a repetitive pattern that can be scaled to any size. The scale may change but the ratio is held constant. Now the fractal patterns that shape the atom, according to Daniel Winter also shape our planets and stars, in fact the universe. A fractal has self-similarity at all scales, it’s the same geometric pattern repeated. The inner structure in a fractal is reflected in the outer structure. Fractal means fraction of the all, indicating that each piece is part of the whole. It is the basic idea of a hologram and this is why according to Daniel Winter the universe at large is just a super-hologram. The fractals of electromagnetic energy interconnect everything with everything within the universe and are the basic building blocks of this hologram. The fractal repetitive structures of electromagnetic energy weave a giant cobweb throughout the universe. The wavelengths of planets and stars are huge in comparison with the wavelengths of the atom, however when their wavelengths fit into the Fibonacci sequence of the Golden Mean, they interfere non-destructively; they implode and form a fractal attractor that we call gravity! This is how the planets and stars are connected by means of imploding electromagnetic waves that we experience as gravity. So if the universe is in essence a hologram and there is only one principle that shapes everything from atoms to planets, stars, and the universe at large, we should find proof of these vortexes, Platonic Solids, and doughnut structures in all parts of the universe. This holographic principle of the universe was first mentioned by the ancient Greek Hermes Trismegistus as one of the seven Hermetic principles ‘As above, so below, as below, so above’. What Hermes meant was that there is a correspondence between the different planes of existence, the macro-cosmos and the micro-cosmos. This Hermetic principle tells us that what we see out there in the universe, in the galaxies, stars and planets, we will also find on a smaller scale inside the atoms. So is there any proof that may corroborate the validity of this Hermetic principle in our universe? The answer is yes there is; the amazing fact of the matter is that recent discoveries reveal that the Hermetic principle and the sacred geometry involved can be demonstrated in both the theoretical unobservable subatomic vortexes of the atom, and the very real observable largest vortexes of hurricanes! Richard C. Hoagland and David Wilcock discovered the pentagonal and hexagonal structures in the eyes of violent category 4 and 5 (Saffir-Simpson scale) hurricanes that have threatened the United States in the last few years. Satellite photos beautifully display the five spoked-wheel observed in the eye of some of these hurricanes. 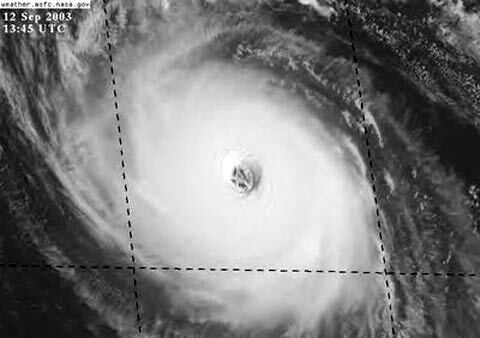 The satellite photo below shows the pentagon in the eye of hurricane Isabel of September 2003. Wilcock and Hoagland theorise in their hyper-dimensional physics that category 4 and 5 hurricanes open up an inter-dimensional gateway with a higher dimension that allows aetheric energy to flow into our physical dimension. This aetheric energy in the form of torsion waves (discussed later in this chapter), create standing waves like the ones in Dr. Hans Jenny’s Cymatics experiments and are the explanation for the observed pentagonal and hexagonal patterns in the eye of the hurricane. We would never have discovered these hyper-dimensional aether structures in the mechanism of a hurricane if the water vapour of the clouds had not arranged itself according to these interference patterns. Wilcock and Hoagland believe that hurricanes are not only feeding on the conventional convection currents caused by the warm ocean waters and cooler air above, but also experience anti-gravity effects in their funnels as a result of the torsion waves. As a result the clouds that form the pentagram on top of the hurricane are raised in the air much higher than normal. The antigravity effect increases significantly and coincides with the formation of the pentagram only when the internal hurricane wind speeds build up to the extreme categories 4 and 5 on the Saffir-Simpson scale. Daniel Winter has a slightly different interpretation of the sacred geometry involved in these hurricanes. According Daniel Winter, the pentagon shape revealed in the two-dimensional satellite picture is in three-dimensional reality, a dodecahedron, and the hexagonal shape represents the top view of an icosahedron. Winter postulates that the nested and fractal structures of the dodecahedron and the icosahedron are the result of imploding electromagnetic waves in the eye of the hurricane. These electromagnetic waves are extracted from gravity, Winter explains, since gravity and electromagnetism are related phenomena. Hurricanes and tornados are renowned for their anomalous electromagnetic effects such as thunderbolts and shining lights in the funnel of these storms. This is an anomaly since hurricanes and tornados are not thunderstorms. So now it seems that nature has provided a real observable phenomenon that allows us to study the hurricane as the Hermetic counterpart of the same vortex that shapes the atom. The doughnut torus shape created by these vortexes can be found in the macroscopic world as well. Surprisingly enough, NASA in the summer of 2004 released new information about discoveries that were made with the European Space Agency observatories the INTEGRAL and XMM-Newton. They discovered that so-called black holes in our universe are actually doughnut shaped torus formations! Black holes are objects with an unfathomable mass. They have the density of millions to billions times the mass of our Sun and the gravitational force of black holes is so strong that nothing can escape from it, not even light. Everything in the environment of a black hole is attracted to the core of the black hole. The similarity between the macroscopic doughnut torus shape of the black hole and the microscopic doughnut torus shape of the atom is apparent. The black hole’s basic characteristic is that its gravitation is so immense that even light cannot escape it. According to Daniel Winter the vortex structure of the doughnut torus structure is actually an implosion of Golden Mean waves that is no less than the equivalent of gravity. It is light that is attracted into the core, just like what happens inside the Black Hole. It is also interesting to note that recent developments in string theory predict that black holes can exist at any scale from the microcosmic scale of particles to the macroscopic monstrous scales of black holes observed in remote galaxies. In fact at CERN in Switzerland they are building a new colossal particle accelerator to be finished by 2007 called the Large Hadron Collider (LHC) and scientists are anticipating that the LHC may actually be powerful enough to spawn miniature black holes. This remarkable fact has become possible from new insights in string theory. String theory predicts not only multiple dimensions but also that gravity unlike all other forces in nature will be active in these additional dimensions. This means that the effect of gravity is far stronger at small distances than conventional theory predicts. In conventional theory black holes can only be created from tremendously dense masses; however string theory now allows for miniature black holes far less dense that can exist even at the subatomic level of particles! Astrophysics is still trying to find out the right cosmological model for our universe. The current accepted idea has been around since the seventies and is the idea that the universe has been created in one giant blast called the Big Bang. Ever since the universe has been expanding, the cosmological model of an expanding universe is called the inflationary model. One of the founders of the inflationary model Dr. Robert P. Kirshner of Harvard University now believes that a cyclic model can better explain the latest discoveries made about our universe. In the cyclic model the universe is re-birthed in an eternal cycle of both expansion and contraction. Recent discoveries have shown that the universe not only expands, but also that this expansion is accelerating. The only source that could explain this acceleration is an invisible energy that permeates the entire universe! Astrophysics has termed this mysterious energy dark energy! Remarkably a cyclic model is the cosmological model that corresponds with the ancient Eastern cosmology. According to the spiritual Eastern scripture of the Upanishads the universe is recreated eternally from the breath of Brahman by breathing in and out the Prana of the universe. There are now a number of astrophysics theorists who have launched the idea that the universe at large has the shape of a giant doughnut torus. One of these theorists is Professor Joseph Silk of the Department of Physics, Oxford University. The most common used method by scientists to model the shape of the universe is to measure and determine the geometry of the cosmic microwave background radiation of the universe, the primordial residual energy of the Big Bang. The new idea that the universe is shaped like a torus stems from the last measurements of the background radiation.. If we assume that the universe is indeed in a perpetual cycle of birth and death then the doughnut torus shape can perfectly explain and model this behaviour. Just suppose that all planets, stars and galaxies move through space in this huge doughnut shaped universe. The center of the doughnut represents the moment of the Big Bang. The center like the center of the black hole is a singularity where all space and time are infinitely compressed. Think of this zero point as the eternal now. Now when we leave the zero point of the doughnut and move outwards through the funnel over the surface of the doughnut, space emerges and starts to expand, time starts ticking. We’ve left the ‘white hole’ of the universe where planets, stars and galaxies are birthed. While traversing over the surface of the torus, space keeps expanding until we cross the equator, the middle plane of the symmetrical torus. Next space starts to shrink again and all space is attracted to the ‘black hole’ opposite pole of the doughnut where everything will collapse again to the zero still point within the doughnut. We’ve completed one complete cycle of birth and death! The eternal cycle of the universe would be such that everything is being birthed from a singularity, (The Big Bang), the white hole of the universe. After the universe’s birth we move for billions of years through space to end up where we started to be attracted again into a huge black hole. From there on the next cycle is started. Recent discoveries made by astrophysics have also shown that the Platonic solids can also be found in the clustering of galaxies. In our galaxy, the zodiac with its twelve signs actually has the geometry of a dodecahedron with its 12 faces corresponding to the 12 houses or signs of the zodiac! Platonic Solids also show up in the Earth’s energy fields as will be demonstrated in the next chapter. The ‘aura’ of the Earth is a dodeca-icosohedron grid (nested dodecahedron and icosahedron) that is referred to as the Earth grid for short. Richard Hoagland together with David Wilcock have pointed out that there are planets in our Solar System that show geological stress points at exactly 19.47 degrees latitude. Examples are the Great Red Spot on Jupiter, the Great Dark spot of Neptune, the Sun’s area of the largest sunspots. The 19.47 degrees latitude stress points can be explained if we consider the interlaced tetrahedron energy structures to be present in the sphere of these cosmic bodies. The correspondence principle of Hermes Trismegistos ‘as above, so below’ is valid also for the Platonic solids in the aura, the energy field of the human body. Science in the nineties has actually corroborated the existence of the bio energy fields of the human body that were already known to the Chinese for thousands of years, know as the Chinese meridian system and the seven chakras in the body. The eastern Chakra systems of the body have been identified as nodes in the human body where vortexes of subtle energy from higher dimensions interfere with the physical body. Many ancient traditions mention that the aetheric energy counterpart body of the physical body as the vehicle of the human soul. Supposedly the energy structure of the human aura contains the wave interference patterns of the Platonic Solids especially the star-tetrahedron. The energy body in ancient Egypt was called the Merkaba. (Mer=rotating light, Ka=spirit, Ba=human body). It was believed that the spinning light of the Merkaba could take a person from one dimension into another. It was the light through which the soul descended into the human body and that can also be used to ascend to higher planes. The Merkaba energy field of the human body is an interlaced tetrahedron (double interpenetrating tetrahedron, one pointing upwards and one downwards; see the cover of this book). The Merkaba is mentioned in many religions such as in the Jewish Kabbalah, which describes it as a counter rotating energy field that affects both spirit and body. In the Bible Ezekiel called the Merkaba the vehicle of light. This vehicle of light allowed the soul to travel between parallel dimensions. Kings 2:2 tells the story of prophet Elijah and Elisha who crossed the Jordan river at Beth-El when all of a sudden a Merkaba of fire appears and Elijah disappears in the whirlwind. Elijah had vanished from the face of this Earth and ascended from the physical plane. The Merkaba is also preserved in Islam in the ancient Islamic mysticism of Sufism. The dervish Sufi dancer expresses the Merkaba by spinning in a counter clockwise dance his robe, creating two spherical discs that express the toroidial shape or torus shape of the Merkaba. Sacred geometry researcher Drunvalo Melchizedek has put much effort in reconstructing the significance of the Merkaba; he mentions that the human body creates the Merkaba as an electromagnetic energy field around the body. Ananda Bosman has launched a whole new science that he has coined Vortexiajah. Vortexiajah stands for a physics of vortexes within vortexes that perfectly corresponds with Daniel Winters implosion physics. Ananda explains that the Merkaba or the Light Body Star Ship as he mentions it is the vehicle between the third dimension and other higher planes of existence. He claims to be able to travel out of body using his Merkaba. His first outer body experiences spontaneously occurred after a serious accident where he almost lost his life! He claims to be in contact now with a higher intelligence helping him to shape his new physics Vortexiajah! Sacred geometry patterns of electromagnetic energy also occur in the energy field radiated by the heart. The human heart has an electromagnetic field in the form of a doughnut toroidial field (perfect torus) triggering the 7-layered muscles in the heart to beat. This toroidial energy field is the animator of the heart according to Daniel Winter. Another example is the geometry in DNA. DNA has the geometry of ten interpenetrating dodecahedra spiralling along the helix. It requires ten Phi spirals to create the top view of DNA. The basic geometry of DNA is that of a dodecahedron. Since Daniel Winter assumes that the universe is one huge super hologram and that everything in the universe is connected with everything else by means of Golden waves, he believes that DNA is electro-magnetically coupled with the Earth grid and the Zodiac by means of the fractal dodecahedron shapes of energy. But how does the aether relate to the zero point field that quantum scientists have discovered? Are they one and the same thing? The only difference I believe is how these fields are being described. Both fields describe energy that is everywhere in the universe. Quantum physics however describes the zero point field as the collective energy that is released (virtual photons) by all of the subatomic particles in the universe when they fall back from their excited state to their energetic ground states (called the Lamb shift after Willis Lamb). The sum of all this energy is what creates the zero point field. On the other hand the subatomic particles borrow energy (virtual photons) from the zero point field pushing them into a higher energy state. The give and take of virtual photons of energy is what shapes the zero point field. In this way empty space, the vacuum is actually a plenum of electromagnetic energy (virtual photons) spanning all frequencies in the electromagnetic frequency domain. In contrast with quantum physics the aether theories state that there are no particles only waves. The zero point in the aether theory of Daniel Winter is the perfect stillness, the alpha and the omega of creation. This zero point is perfect stillness and infinite movement at the same time. It’s the same thing. How can this be? How can these opposites be the same? The cascade of Golden waves creates an infinite series of higher harmonics and when all the waves are added up using the Fourier principle it creates a flat wave of zero Hertz, perfect stillness! Now think of a glass of water, if you start to vibrate it slowly, you will quite clearly see wave fronts in the glass. When we increase the frequency, it will be harder to notice the water surface is vibrating. If we add in all possible vibrations with frequencies ranging from extremely low to indefinitely high, the sum result of all these vibrations will turn the water into a smooth surface again. The water has become calm again. This calmness however is illusionary since the water is both at rest and shaking like hell all at the same time! That is what the zero point field in essence is; it’s complete stillness (0 Hz) and filled with an infinite cascade of Golden harmonics all at the same time. The waves that create matter and that by means of fractals move into the nucleus in an increasing cascade of Golden waves speed up and exceed the light speed. But where do they go? They center into the zero point, back from where they came. In this sense, the zero point is the alpha and omega of creation! The zero point is perfect stillness and unimaginable abundant activity at the same time! They are two sides of the same coin, it’s like a snake biting it’s own tail. Scientists like David Wilcock and Daniel Winter take the notion even further, they say the aether energy has properties of consciousness, they conclude that there is no dualism in the physical and the mental realm. The aether energy is pure consciousness energy and since it shapes our entire universe, the universe itself must be a living intelligent being. So if this fact can be proven aether physics seems to be a scientific corroboration of the tenets held by many Eastern spiritual traditions that the source of our universe is a life force energy, a spiritual energy called many names like Prana, Ki, Chi, Akasha to name a few. In this chapter we’ll present some ‘proof’ of this startling conclusion, although scientists have different ideas to come to this conclusion. For instance David Wilcock refers to Russian research on torsion waves that travel as spiralling impulses through the aether at a billion times the speed of light. They are caused by many types of events such as the movement of physical objects but also surprisingly enough by conscious thought! Russian discoveries revealed that our thoughts and feelings extend far beyond the body and travel through the universe! Quantum physicist David Bohm also believes that the universe is holographic in nature and that there is an undivided wholeness of all things. It is useless to think in terms of separate particles since they are like little whirlpools in the river, you can’t tell where the whirlpool starts and the river ends. Bohm goes on to say that consciousness is not only present in animate life forms but also in inanimate matter since, energy, space, time and consciousness are not separate things according to Bohm. Amit Goswami says that consciousness must be the ground of all being to solve the ambiguity of the Copenhagen interpretation of quantum science. So it must be consciousness that is primordial and shapes the physical. Amit Goswami is the author of the book ‘The self-aware universe’. Daniel Winter explains consciousness as follows; wherever the aether waves organize themselves around the torus to become fractal or recursive, they turn around the torus to meet themselves, they become self-referential. Not only do they create gravity but also self-reference or self-awareness in the process. Self-reference is the principle of being self-aware and is the definition of consciousness according to the ancient Vedas. The Golden waves in the fractal geometrical patterns are attracted to the zero point, the focal point of the atom. The zero point acts as a fractal attractor drawing into it all the electromagnetic waves that can be shared to ride the roller coaster of the cascading Golden waves. In a sense it’s a miniature black hole attracting the light into itself meanwhile creating not only gravity but also self-awareness. But if recursive electro-magnetic waves forming fractals is the true nature of consciousness, it means that consciousness is not restricted to life forms only but also inanimate objects must have a kind of consciousness. All material things in the universe must be self-aware! Indigenous tribes like the native Indians of America and the Australian aboriginals for instance have always claimed that everything from the raindrops to rivers, from rocks to mountains are alive. Conscious life is not restricted to animate life forms that dwell upon the land; the Indians believed that every material thing had a soul, including the land. To these people all of creation was alive and part of the whole; they worshipped the mountains and the rivers, the moon and the Sun just as much as the animals and plants. Our western culture regards the ancient religions as primitive since the ancients worshiped the stars and planets as the Gods of the Heavens. Maybe they didn’t have such a primitive and poor concept of reality after all? Maybe it is us who have some catching up to do? It is now dawning in science that the universe may be self-aware. This implies that all atoms, planets, stars, etc, are self-aware and have some form of individuality. We can no longer speak of consciousness that is restricted to organic life forms alone; consciousness can reside in many forms including stars and planets. The universe itself may be one conscious being that we humans are part of. This makes every single focal point of electromagnetic waves an individual consciousness that is part of the universal consciousness. Human individual consciousness focusing in the human body is simply a piece of the total consciousness of the universe. The brain is merely the antenna tuned to receive the individual consciousness from the universal consciousness just like the quantum brain theory suggests. Each individual mind however also has access to the universal mind. It would explain how the universal consciousness was accessed by so many geniuses like the greatest philosophers, scientists, artists and musicians that have inspired us throughout the Ages. If we accept this, then within this holographic concept of consciousness our separate egos must be illusions. A growing number of physicists today believe that the universe indeed is self-aware. Why is it that almost all of the world religions associate God’s consciousness with light? The Bible tells us that God is the Light of the world! Daniel Winter’s implosion physics now tells us that it is conscious light that creates the material world! Could this universal consciousness that many like to refer to as God be the zero point in the aether, the still point, the fractal attractor in chaos theory that draws all the light of the world into itself where all is One? The zero point could be regarded as the source and destination, the alpha and the omega of creation. Daniel Winter tells us that it is this universal consciousness that focuses the waves into the zero point and keeps it spinning, it can be compared with the Gforce mentioned in AetherDynamics! But wasn’t God also associated with unconditional love? If God is really to be associated with conscious light then where is the love in all of Winter’s Golden waves? Manfred Clynes, a former concert pianist studied the relation between music and emotion. During his many performances he learned that certain parts of his playing moved people more than others. He wanted to find out what it was in music, what pitches and notes touched people more than others. He embarked on a scientific career to find out. He studied the wave shapes that were related to human emotions. The tender hugs and caressing between people seemed to follow predictable envelopes of pressure that were universal. His studies showed that they were not related to cultural, religious or racial backgrounds. All over the world people seem to follow the same recipe for creating emotions in waves. Expressions of anger and hate where people push and jerk the other also follow predictable wave paths of pressure. Amazingly the emotion associated with love is Golden Mean related! If we’re hugging our loved one and we express the feeling of love, the maximum pressure in the hug is at exactly the Golden Mean ratio with respect to the total duration of the hug! Relation between emotions and wave envelops. Daniel Winter concluded from Manfred Clynes material that love must be Golden Mean related! So it seems there is only one way the universal consciousness of the universe can create. It requires the loving non-destructive interference bending of light into fractal structures of geometries that allows the waves to stand and interfere eternally. The higher harmonics in the Golden Fibonacci sequence are all based on the longest Phi wave, the carrier wave. The cascade of electromagnetic waves all braid on this Golden wave with the longest wavelength, the long Phi wave or lo-Phi wave, the love-wave! Is lo-Phi the origin of the word love? So it seems only love creates and we can now appreciate that the loving waves that interfere with each other is what creates the material world. If the interfering waves did not maintain the Golden Mean ratio in wavelength, destructive interference would be the result and the material world could simply not exist. Isn’t it true that love can move mountains and that hate and anger destroys everything? We can see the same principle expressed in waves that lovingly construct the material world! When the waves hate each other, they compete and kill each other! Light in a straight line is energy, loving light bent around a focal point creates matter and it’s the universal consciousness that keeps the waves centered! If the universal mind of the universe, God is the light and love of the world, like the Bible has always told us; we can now appreciate it from a scientific perspective! Daniel Winter is a member of the Heart Coherence Team that has developed a Heart Tuner ®. The Heart Tuner is a heart/brain biofeedback system that is able to measure the coherence between the heartbeats (Electrocardiogram ECG) and the brainwaves (Electroencephalogram EEG) of an individual. It is used by therapists and researchers but is also suited for individuals to establish balance between the heart and mind. For the first time in history we’re able to really measure human emotions such as compassion, empathy, love, anger and frustration. The Heart Tuner uses the electromagnetic waves of the heart and the brain and is able to determine if there is harmony between them, in other words if there is coherence between heart and mind. What the Heart Tuner does is that it checks whether our feelings and thoughts are balanced. For ages we’ve believed that the heart is the home of our feelings and emotions, it is expressed in almost any popular love song, however human emotions can now really be measured and they stem from the heart indeed. Emotions are reflected in the waves of the ECG. Also our thoughts leave a fingerprint in the electromagnetic field of the brain, our brainwaves recorded in the EEG. The Heart Tuner picks up the signals of the heart and the brain and is able to detect phase locks between the waves of the ECG and the EEG. When a phase lock is detected, not only do the frequencies in the heart signal match up with the frequencies of the brainwaves, also their phase matches, the waves are harmoniously connected! In technical terms the signals are said to be coherent! What really is happening is that the person involved is balancing his feelings and his thoughts and he’s experiencing peaceful, joyful feelings, bliss. Can be used to eradicate addictions. Now how does the Heart Tuner work and what is really happening in the frequency spectra of the heart and brain? First of all, the sonic sounds of the heart, the heartbeats are translated into electromagnetic pulses by the thymus of the heart and the glands in our body that act as piezo-electrical devices translating sonic pressures into electromagnetism. This is how the heart creates an electromagnetic field that can be measured as an ECG. Daniel Winter discovered that people who are experiencing true feelings of love leave a signature in the frequency spectrum of the heart, the ECG. What happens is that the frequency components in the spectrum become Golden Mean related (Phi)! Surprisingly also the brainwaves can become entrained, phase locked with the heartbeat waves! Brain and heart waves beat at the same pace and in the same phase connected by the Golden Mean (Phi). The result is our by now familiar cascade of Golden electromagnetic waves just like we’ve discussed before that is happening inside the atom. According to Daniel Winter, the cascade of Golden electromagnetic waves ends up as blue light in the DNA of our body! The DNA is a kind of a lens attracting the electromagnetic energy into itself. So how does the heart and brain waves that have long wavelengths connect and lock with the much shorter wavelengths of the DNA? It’s the Golden Mean ratio that bridges the scale of the long wavelength of the heart and brain waves to the short wavelength of DNA. When our thoughts and emotions are attuned to love, a cascade of Fibonacci series of harmonics is created that links the energy of the heart and mind to our own DNA. So emotion is really energy, it is energy in motion, e-motion. Emotion is like a roller coaster conveying the emotional energy from the heart to every cell in our body into our very own DNA. The energy of our emotions moves between these scales of long waves to short waves and is finally delivered to our DNA. Fritz Popp had previously discovered the bio photons, the blue light in the body and assumed that it was somehow related to DNA, Daniel Winter explains us the wave coupling mechanism of how the energy of the mind and heart is delivered to our very own DNA. When the heart expresses the emotion of love it creates a cascade of Golden Mean electromagnetic waves, in fact it creates gravity just like the atom does when it attracts by Golden Mean braiding electromagnetic waves into the zero still point. Why have we always associated love with gravity? Why do we use words like I’m attracted to you, like the moon is to the Earth, when we’re in love with someone? Why has our emotion always been associated with weight? When Isaac Newton saw the apple fall from the tree, he just discovered gravity. He ran off to tell others and explained the principle of gravity by saying that the apple is attracted to the Earth. The people stared and laughed at him, the whole idea seemed preposterous, how could an apple be attracted to the Earth? Are they in love? Only people in love are attracted to each other. It took Newton a long time before people started to get used to the idea of gravity as a force of attraction. In those days, Newton would have done better to take other words to explain the principles of gravity. However taking Daniel Winter’s theory of gravity literally, the word attraction seems just fine; it now seems appropriate three hundred years after Newton to say that the Earth and the moon are in love and that it is gravitation that is drawing a man to a woman! Daniel Winter also used his Heart Tuner on a trained yogi who went into a deep state of meditation. Formerly he had instructed the yogi to focus on a tree and to send loving thoughts to the tree. He placed an antenna near the tree and linked both the yogi and the antenna near the tree to his Heart Tuner. The antenna under the tree picked up the Earth’s electromagnetic Schumann waves. The Schumann waves named after German Professor W.O Schumann were discovered in 1952. The Schumann waves are a result of the Schumann resonance, a frequency resonation of about 8 Hertz that occurs between upper layers in the atmosphere and the Earth’s crust. It is called Gaia’s heartbeat. The Schumann resonance is somehow related to human consciousness since brainwaves operate in a frequency domain that includes the 8-Hertz Schumann frequency. Spacecraft of NASA are all equipped with a device that simulates the natural Schumann resonance frequency. From early space travel NASA learned that astronauts get disoriented and distressed when they are shut off from the Schumann resonance. As a human being we depend on it. Daniel Winter demonstrated that the trees in the woods act like huge antennae that pick up the Schumann frequency and amplify it. When hooked up to the Heart Tuner he noticed first of all that that the yogi’s ECG and EGG were coherent as expected from earlier experiments. However he also found that the yogi’s brainwaves and heartbeats had become coherent with the Schumann resonance of the Earth! What he demonstrated with his experiment is that when we feel love we tune into and become one with nature itself. Daniel Winter now believes that all biological life depends on the Schumann resonance as the carrier wave, the long Phi wave to braid electromagnetic Golden waves. Humans can link up to biology and to mother Earth itself for that matter. The heartbeat of this planet is the Schumann resonance. It may be the explanation why a walk in the woods is so refreshing and why people like to spend time in nature. Being completely shut off from the Schumann resonance on high altitudes in a plane where the fuselage acts like a big Faraday cage, is now believed to contribute to the effects of a jetlag. Daniel Winter warns us of the hazards of electromagnetic smog in our biosphere; it destructively interferes with biology itself and finally causes cancer. We’ve shielded ourselves from the natural Schumann resonance and the Earth grid energies by hiding in concrete buildings and by destroying the green forests of the globe, the antennae that amplify the Schumann resonance. The power grid in the United States that drains current into the Earth causes the worst case of electromagnetic pollution and this activity should be stopped immediately according to Dan Winter! Nikola Tesla around 1900 was the first to experiment with two spiral coils (caduceus shaped). He fed the two coils with opposing alternating currents such that they would create electromagnetic fields that would be self-cancelling. Although the electromagnetic fields were cancelled out, he demonstrated that his Tesla coils were nevertheless able to transmit energy over long distances. He had actually discovered a new form of energy. Remarkably Tesla’s waves did not loose its energy at the inverse square of the distance as normal electromagnetic energy does, even over long distances there was no loss of energy to be noticed. Tesla’s work on this revolutionary new form of energy was almost forgotten in history. It retrospect it seems his work was too revolutionary to be accepted by society in the last century, especially its application of free energy. This is why his work nearly disappeared without trace. Fortunately the same form of new energy was independently discovered in the nineteen fifties by Russian astrophysicist Dr. Nikolai A. Kozyrev (1908-1983). Kozyrev’s discoveries were kept secret by the Soviet Union during the Cold War. It was only after the fall of the Iron Curtain that Kozyrev’s discoveries were slowly revealed to the West. In the Soviet Union thousands of academics have delved into this subject after Kozyrev’s initial discovery of this new form of energy. Kozyrev proved the existence of the aether once and for all. This new energy is neither electromagnetic in nature nor does it relate to gravity as it stands on its own. The new form of energy discovered by Kozyrev is a spiralling non-Hertzian electromagnetic wave that travels through the vacuum at super-luminal speeds, a billion times (10⁹ C) faster than light. Due to the spiralling nature of the wave, the wave is called a torsion wave since it traces a spiralling path! According to independent researcher David Wilcock the torsion wave also traces a perfect Phi spiral! Torsion waves are called non-Hertzian waves since they do not obey the classical theory of Hertz and Maxwell. Einstein and Dr. Eli Cartan predicted the existence of static torsion fields in 1913 in a theory that became known as the Einstein-Cartan Theory or ECT for short. Torsion fields never got very much interest in physics until Kozyrev discovered their actual existence. We have already discussed torsion waves in chapter 4 about the zero point field, where we mentioned that Tom Bearden discovered that the fundamental wave in the electromagnetic wave is a scalar wave. The scalar wave is the wave that remains when two opposite electromagnetic waves interfere cancelling out the electric and magnetic field components, just like Tesla did. The result is a hitherto unrecognised component in the electromagnetic wave, a longitudinal wave vibrating in the same direction it is travelling. Maxwell’s classical electromagnetic wave theory that is still the prevailing theory today for electromagnetism does not allow for scalar waves and accounts for transverse electromagnetic waves only. These transverse Hertzian waves named after Heinrich Hertz, are created when electric charges oscillate from side to side in a dipole antenna. At a distance they will induce a transverse force on a charge in a distant radio receiver antenna when aligned perpendicular to the propagated direction of the Hertzian wave. Scalar waves, lacking transverse polarity, are generated in a totally different way and cannot be received with a normal dipole antenna, the antenna used in all of our ordinary electronic receivers. This is also the explanation for why this new form of energy has not been discovered much earlier. Tom Bearden’s scalar waves now get support from Paul La Violette whose sub quantum kinetics theory not only predicts the Hertzian transverse waves but also Tesla’s longitudinal scalar waves. According to Paul La Violette a monopole antenna such as a charged sphere will create longitudinal scalar potential waves when periodically charged and discharged. Scalar potential waves can and have been detected using a Bendini detector. To prevent the misconstruing of scalar and torsion waves mentioned in this book, they are synonyms for the same wave. Scalar or torsion waves now seem to play a significant role in explaining our physical reality. Although torsion fields are very weak they can be measured using torsion beam balances that were first developed by Kozyrev. Torsion waves create minute forces in matter and that’s how they can be detected. Torsion fields can be either static or dynamic. Static torsion fields can take on the form of vortexes like the one mentioned in the implosion physics of Daniel Winter. These static vortex torsion fields in the fabric of the vacuum space can stay in one place for a very long period of time. Kozyrev discovered that torsion fields can also propagate through space as torsion waves at tremendous speeds at least one billion times the speed of light (10⁹ C). He noticed that all physical objects both absorb and radiate torsion waves. By shaking, vibrating, deforming, heating and cooling physical objects they generate measurable torsion waves. Even the displacement of an object generates torsion waves that can be measured. All movement therefore from the vibrations of atoms to the orbits of our planets and stars leaves their traces in the form of torsion waves in the aether. A very remarkable phenomenon that Kozyrev discovered by rotating gyroscopes is that they lose very small but measurable amounts of weight. Also firmly shaking objects could make objects lose weight. Now from our current understandings of physics this is quite impossible! It violates all physical laws, how can solid matter lose weight when it is spun at high speeds or shaken? If we still believe that matter is made of little hard marbles called particles, yes this would be a great mystery! However Kozyrev showed that the gyroscopes shed more torsion waves when shaken or spun, so that aetheric energy that sustains the object was shed back into the background sea of the aether. The momentary loss of aether energy accounted for the weight drop. Dr. Harold Aspden of Cambridge University discovered a related phenomenon. He attached a powerful magnet to a gyroscope and spun it at high speeds. He measured the amount of energy required to accelerate the gyroscope to full speed to be a 1000 Joules. Now to his surprise when he stopped the gyroscope from spinning and restarted the gyroscope to spin again within 60 seconds after it stopped, it required 10 times less energy to spin the gyroscope to the same speed. The spin of the gyroscope had added extra spin to the aether that sustains the gyroscope that lasted for a while before it wore off, rather like the momentum stored in the tea of a teacup after stirring it with a teaspoon. We now know that spinning magnets are strong torsion wave generators. Another violation of the laws of Newton with respect to torsion fields comes from Bruce De Palma. He conducted experiments where he catapulted two identical steel balls at the same speed under the same angle into the air. The only difference between the balls was that one of the balls was rotating at 27000 revolutions/minute and the other was not. The spinning ball reached far higher into the air than the non-spinning ball. By the spinning of the ball torsion fields were created that caused a slight change in the total mass of the ball. Kozyrev discovered that stars also radiate torsion wave energy and postulated that these torsion waves were generated due to the spinning of the stars. From his astronomical observations of stars using dedicated telescopes to measure the torsion wave radiation, he noticed that the star radiated this torsion wave energy from a location in the sky that must be the true position of the star whereas the visible light of the star reveals the position of the star many years ago since it took many light-years before this light reached the Earth. From this observation he concluded that the torsion wave must travel at super-luminal speeds. He even noticed that torsion wave radiation was received in a location in the sky that revealed the future position of the star! Since torsion waves travel at super-luminal speeds, they can cross the time barrier and ‘move’ into the future. Since the Earth also radiates torsion waves and this torsion radiation is much stronger near the poles, Kozyrev’s experiments are geographical location dependant. He also noticed that his effects could only be measured during the cold periods of the year. In the summer the intense solar torsion waves interfered with the torsion waves of his experiments. Our Sun is the greatest torsion wave generator in our Solar System. Torsion waves flow in and out of all physical matter and atoms are basically all torsion wave generators. The counter rotating Phi spiralling electromagnetic waves in the implosion physics of Daniel Winter that spiral into the nucleus of the atom, likewise cancel the electromagnetic components of the electromagnetic waves and results in a torsion wave. It accumulates ‘infinite’ energy due to the implosion of the waves into smaller and smaller wavelengths. The shorter the wavelength the more energy is contained in the spiralling wave. Like the tornado accumulates energy and focuses it into the eye of the tornado, the electromagnetic vortex accumulates energy into its still-point. Notice that it is the extreme spinning of air molecules in the eye of a tornado that gives it its immense destructive power. A spin field of electromagnetic energy stores inertia (the resistance to movement). The more spin, the more inertia is stored. The same inertia effect is demonstrated by spinning tops and gyroscopes that resist any change to their momentum. If we appreciate these two effects created by torsion fields, we may start to understand why matter and energy are interchangeable (Einstein’s famous formula E=m* c^2) and what it is that gives matter its solidness. Matter internally has properties of inertia that gives it mass. So in reality, there is really nothing solid about matter. Mass is the illusion of a solid thing, it’s the Maya of the material world mentioned by the Tao. This illusion is sustained by the stored inertia in the waves and has tricked science into maintaining a false concept of inertia. We’ve always believed that inertia is an inherent property of mass, but the truth is just the opposite, the stored inertia of spinning electromagnetism in a local region of space creates the effect we observe as mass! There is little known in Western science about torsion fields created by matter spun at high speeds. NASA has just recently launched a satellite in April 2004 to investigate the spin fields of the planets in our Solar System. Since most scientists believe that the spin field is a property of matter, they fail to recognise that it is the torsion field that creates matter in the first place. Bruce de Palma’s spinning gyro experiments proved that gyroscopes actually lose weight. This phenomenon is totally unexplainable within the current scientific paradigm, however if we understand that by spinning an object we change the overall electromagnetic spin stored in the object, we may see why it has a feeble but measurable affect on its mass. We can now also start to see why Haisch & Rueda, discussed in chapter 4 ‘The Zero Point Field’, were able to prove Newton’s famous law of inertia F=m * a. They proved that inertia is the effect caused by accelerating mass through the zero point field. Well since the electromagnetic vortex within the atom stores both zero point energy and inertia, we’re not surprised to find a correlation here. Static torsion fields in the form of vortexes in the aether and the spiralling torsion wave travelling at super-luminal speeds are getting more and more attention in Western science. According to some, torsion waves are the missing link in the search for a final ‘theory of everything’, Einstein’s unified field theory. It seems that electromagnetism, gravity and torsion waves are all members of the same family; they are just different forms of aether vibrations. Consciousness is related to aether vibrations. Our very thoughts and emotions create torsion waves that travel at super-luminal speeds to the far ends of the universe. Torsion waves may be the physics for telepathy, the ability of mind reading between two individuals. Since torsion wave can physically affect matter, it may also be the explanation for psychokinesis or PK, the ability to mentally change physical objects. Stage performer and spoon bender Uri Geller has always demonstrated these abilities in front of large audiences. Although many still think he was a conman, he has been subjected to scientific scrutiny but they could never disprove his ability. During the Cold War Russian scientists experimented a lot with psychics because they believed that their abilities were genuine. Now we may remember from chapter 3 ‘Science and Consciousness’ the research programs of Dr. William Tiller into the effects of human intention. He used test persons to imprint their intentions into his IIED device and asked them to manipulate the outcome of an experiment, for instance the lowering of the acidity of water. The IIED device was placed in a room for extended periods of time and the effect of lowering the acidity of water could clearly be measured. After a while the IIED device could be removed from the room and the effect continued. The room had somehow become conditioned. Now the conditioning of this room may be explained by the presence of static torsion fields that were imprinted in the physical vacuum of the room by human intention! These torsion fields created by means of human intention are able to create subtle changes in matter. In 1984, Dankachov showed that static torsion fields could also be memorized in water. Water proves to be a good medium for storing static torsion fields. The late French biologist Jacques Benveniste has proven that water is able to memorize the constitution of chemical compounds that were dissolved in it. Somehow a torsion field can be created in water that is a fingerprint of the chemicals dissolved in the water. After diluting the water a great number of times such that no possible molecules of the original chemical compounds could be found, the heavily diluted water still maintained its properties as if the original compounds were still in there. What had happened is that although no molecular traces could be found in the water, there was still the imprint in the water of the original torsion field of the chemical compounds. Benveniste also demonstrated that by simply placing a second bottle next to the first one he could copy the properties of the water from one bottle to the other. The torsion field of the first bottle of water was induced into the second! Prof. Dr. David Schweitzer is able to photograph this memory effect of water. He has a fairly simple method to measure the water memory effect of water and the imprint they leave behind in the water. He takes a water drop and allows it to dry up at a tilted angle. Next he investigates the dried up water drop under a microscope and shows how interesting light structures become visible. The memory effect of water may be a physical explanation for homeopathy. Many people are very sceptical about homeopathy because how can clear water that has been diluted so many times such that all chemical compounds are gone still have a medical effect? Pure water can’t have a healing effect can it? However the invisible torsion fields that are present in the water may be the reasonable explanation for this phenomenon. The imprint of human intention into the ice crystals of Dr Masaru Emoto is yet another example that can be explained by torsion waves radiated by human thoughts and emotions. The torsion fields created by human intention are simply memorized in water. At an invisible level the internal structure of water has changed. After freezing the water these changes manifested in the different shapes of the ice crystals and were visible to the naked eye. At Sound Energy Research they created torsion field imprints in water using scalar (torsion) wave technologies. They treated distilled water with scalar waves and a dedicated coil developed by Dr. Glen Rein. The result is structured water called scalar wave structured water™. They sent samples of this water to Dr Masaru Emoto who froze the water samples and studied the crystals. They formed perfect hexagonal structured ice crystals. This is yet another example that indirectly proves that consciousness and torsion waves are related since both human conscious intention and scalar waves seem to produce the same results in Dr Masaru Emoto’s experiments with ice crystals. Sound Energy Research sells their programmed ‘smart’ water in bottles in three different flavours. By using different intentions they added different programming to the water. The water is said to have relaxing and healing properties. Torsion waves are very remarkable waves as they never wear off, they propagate to the far corners of the universe without losing their power and in this respect they have eternal life. Torsion waves as they travel through the physical vacuum do not encounter any friction; therefore they maintain their energy. As torsion waves traverse the universe they interfere with other torsion waves. Over time they weave a tapestry of the history of all that has ever happened within the universe from the movement of the smallest subatomic particle, to the revolution of the planets, and the expansion of galaxies. Remember that torsion waves are generated by many phenomena such as the vibration or displacement of matter, electromagnetic energy and our conscious thoughts to name a few. Torsion fields are therefore information fields as they encode everything that has left its traces in the form of torsion waves in this universe. This boils down to the recording of every little thought that was ever thought and every little move that was ever made. The interference patterns of the torsion waves form a huge hologram that permeates the whole of the universe. Just like the waves of the seas form an interference pattern that in theory allows us to decode the movement of the ships that stirred its surface, likewise torsion waves theoretically allow us to decode the history of our universe. The only difference between the waves at sea and the torsion waves is that the sea waves eventually loose their energy as they crest at the shores. The superposition of torsion waves and their memory capacity however is limitless and eternal. Torsion waves allow for information transfer across the universe, connecting every atom with every other atom and since torsion waves travel at super luminous speeds they could be the explanation of the non-local effects that were predicted in theory and empirically discovered in quantum physics. The information field created by torsion waves allows for a coherent whole of the universe, connecting every little atom with all other matter in the universe, informing it of its whereabouts and activity. In fact scientists are discovering a very high state of coherence in our physical universe that cannot easily be explained if the universe is a bunch of single individual parts of atoms, molecules, planets and stars that only maintain contact by separate forces such as gravity acting upon them. Quantum entangled particles keep their coherent relation eternally and are not bothered by any distance separating them whether it be a few millimetres or the distance of a galaxy. These coherent relations can only be explained if an invisible field permeates the universe that interconnects them. The information field described above is termed the A-field by Professor Emeritus Ervin Laszlo. Laszlo in the last four decades developed an integral theory for everything; instead of specialising in one particular field, Laszlo has studied many fields of science and finally developed an integral system theory. According to Laszlo the A-field is more fundamental than energy and matter in the universe. It’s this primordial information field that is the ground of our universe interconnecting everything with everything rendering our view of separate entities in this universe useless. In his system theory there are no separate entities at all; ‘separate’ entities that we observe in our universe are all embedded in one seamless interwoven net of connections. The A-field of torsion waves may be new to science but its existence has been known for thousands of years in the East. The only new thing about it is that it is being rediscovered by western science. Eastern spiritual tradition has named this field the Akasha field. Akasha is a Sanskrit word meaning radiating or shining, it’s a synonym for aether. Akasha is the womb of creation bringing forth every physical aspect that can be perceived with the senses according to eastern traditions. In ancient eastern spirituality the history written within the Akasha field are called the Askashic chronicles, the book of life that records everything that has ever happened or will happen in the universe. The Akashic chronicles or Akashic records contain the story of every soul that ever lived on this planet. The Akashic records are holographic torsion fields of individuals that embed in larger holograms of groups of peoples such as nations. The holograms of nations weave the hologram of humanity on Earth and resembles what Carl Jung called the collective mind of man. The A-field or Akasha field can explain the psychic abilities reported by many people to see into the past and know about events that took place in this world that were not perceived by any personal cognitive conscious experience. The Akashic records are the storehouse of information that has been consulted by all great seers throughout the ages including Edgar Cayce. The author of this book personally testifies that psychic gifted people are able to read the Akashic records. In the past I have been consulting a paranormal practitioner for a long time. Being born as a very sceptical person, my disbelief in the paranormal however eventually melted as I was confronted with many unusual cures that I could not explain. I also shared many experiences with other clients of this practitioner during the long waiting hours in the waiting room. During one of my consultations I handed him a photograph of someone close to me without disclosing any prior details about the person in the picture, not a single word. I simply asked if he could help this person. He held his hand above the picture to sense it while he started to reveal to me what had happened to this person in clear details and quiete explicitly explained the situation this person was in. The information hit me right in the face for I knew he was right. I was totally flabbergasted by the experience since there was no way he could know the details he was revealing to me! From this moment on I knew with absolute certainty that there was something fundamentally missing in my understanding of what I believed to be my materialistic reality. To me this personal experience changed my scepticism about the paranormal once and for good. After my first experience I met and talked to several people with paranormal abilities. I can therefore from my own experience testify that psychic abilities to read the Akashic records are real and that indeed everything that has every happened in this world must be written in the vacuum fabric of space and time. Human consciousness is able to read this book of life. Today I believe there is no woman more convincingly demonstrating her psychic abilities than the famous American medium Char Margolis. She conducts readings on TV-shows where she is able to give the most amazing details about the deceased loved-ones, always starting by spelling out the names of the spirits she’s contacting! She is able to see spirits, read thoughts and foresee events reading from the Akashic records. Her mission is to show people that death is not the end but really the start of a new beginning. She is also here to tell us that each one of us has these innate intuitive abilities just like she has. I think everyone of us at least has had one or more experiences in his life where he or she suddenly had access to information not perceived by the senses. What we call intuition, a sudden insight or feeling that informs us about a situation, may be explained by moments of unconsciously tapping into the Akasha field and having access to information we can’t logically explain. Sometimes we just know things! Twins who are emotionally very close often keep a telepathic contact and unconsciously know about each other especially when the other twin half is in distress. Twins often have an ability called twin-pains; they are able to sense the pain of the other half in cases of, for instance, a severe toothache. Owners of a dog know that their dogs are often mysteriously able to sense their bosses return home after a long day at the office. Animals in nature are able to sense a pending Earthquake. Hours preceding the actual quake animals start to respond very nervously as if they sense something terrible is about the happen. Earthquakes are accompanied by a tremendous release of torsion waves as a result of the frictions that occur in the Earth crust prior to the quake itself. These intensified torsion waves are most likely sensed by the animals’ consciousness and may explain their nervous behaviour in anticipation of the quakes. Humanity has somehow lost its paranormal abilities that are still common in animals. During the tragic events of the tsunami that took place on the 26th December 2004, rescue workers in the aftermath of the Earthquake were amazed to find an almost complete absence of dead wildlife although there were so many human casualties. The reason may be that animals used their 6th sense and felt the impending disaster that caused them to flee to safer places in the higher mountains. It seems our current understanding of psychic abilities and the paranormal is finally catching up. Explanations for psychic abilities have now come into the domain of science that for the first time in history is able to give a rational explanation for these abilities that have been ignored, ridiculed and dismissed out of hand for so long in the West. For the first time in recorded human history we may have a unified theory of everything (T.O.E.) within reach that not only explains our physical universe but also connects it with consciousness, closing the gap between science and spirituality once and for all, 300 years after Descartes. The empty space of the universe is not empty at all. It contains a spiritual energy that modern day science has rediscovered as the aether but this energy has been known for thousands of years in many ancient spiritual traditions by names such as the Chi, Ki, and Prana or Akashic energy of the universe. This energy not only shapes the physical world moment by moment, it is also related to consciousness. Contemporary science is revealing that the firm belief in a distinction between the material and the spiritual world is false. There is no duality, the universe is constructed from one and one substance only and both the physical and mental world springs forth from this single substance called the aether. Amit Goswami, Daniel Winter and David Wilcock are a few of the scientists who have crossed the bridge between science and spirituality and who now believe that the primordial conscious energy of the universe is the first cause of creation. The aether energy can arrange itself into basic geometrical wave patterns that were named after Plato, the Platonic solids to form matter. Almost 2,500 years ago, Plato wrote that the physical world was constructed from the Platonic solids. The Platonic solids arrange themselves in what chaos theory calls fractal patterns weaving a matrix in space interconnecting atoms with the stars. The scales of the Platonic solid shapes are different but the ratios between them are still the same (following the Hermetic principle as above so below). The suggestion coming from quantum science that the probability waves are real waves is now believed to be true. This finally solves the enigma of the wave particle duality of quantum science. There are no particles in the universe, only waves. What we see as a particle is in fact the focal point of vibrations. The idea that God is the light and love of this world as mentioned by many world religions can be taken literally after studies of the work of Daniel Winter. Matter is created from pure light (electromagnetic and torsion wave energy) and as we have demonstrated there is a distinct relation between love and the Golden Mean ratio (Phi) that is required to sustain matter. Since the focal point of these waves creates conscious awareness, every atom in the universe is conscious and the universe itself is One conscious being. The universal consciousness, God is all that is, he’s omnipresent and omnipotent. He’s aware of all things going on in the universe because he’s the universal consciousness. Matter in the universe is attracted by means of Golden Mean braiding of waves towards to the zero point, the alpha and omega of creation. It is the love in those waves that creates the gravity. The late and legendary R. Buckminster Fuller the subject of the Beatles song ‘Fool on the Hill’, discoverer of the importance of sacred geometry, used to put it this way: ‘Love is metaphysical gravity’. If there wasn’t any love in the waves that shape matter they would start to destructively interfere and the universe would collapse into a great void. God is the Gforce in Aether Dynamics and the fractal attractor in chaos theory, attracting all waves towards the center where all becomes One. Russian scientists rediscovered Tesla’s new type of non-electromagnetic energy that travels in spiralling waves and called it torsion waves. Scientists now believe that torsion waves can be regarded as information carrying waves rather than energy waves. It was proven that torsion waves are linked to human consciousness and are created by human thought and emotions. Torsion waves are the interface between the mental and the physical world although we must keep in mind that in reality there is no duality between them. Torsion field physics is the promising physics of psychokinesis and telepathy and shows us how the universe creates a hologram that resembles the ancient information field of the aether better known as the Akasha field. The Akasha field is the book of life that keeps a record of all that has ever happened in this universe and all that will ever happen in the future.